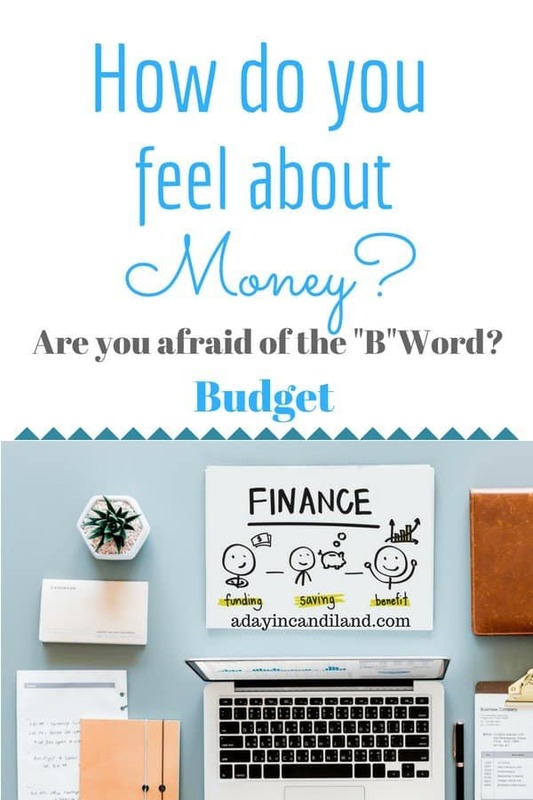 I recently wrote about starting a budget and why you need a budget on my finance blog. While there is so much to learn about money and budgeting, the best place to really learn about money is the Bible. Did you know there are more than 2300 verses in the bible about money? The Bible talks more about money than any other subject. I would say it’s because it’s THAT important. According to Dave Ramsey, your finances are 20% head knowledge and 80% behavior. I can attest to this as I look through my email and each and every one is jumping out at me and say “Don’t miss out, buy now while it’s on sale.” You have heard that word in the commercials “FOMO”, Fear of missing out. It is so true. It didn’t matter that I didn’t NEED it. I might need it someday and I want to get a good deal on it. That’s smart thinking, right? NOT! I have a closet full of the things I needed and got a great deal on that have never been used. Not so smart right? If I could only return them, I would be able to take a nice vacation. Money is a great tool when your mindset is focused on what it can be used for. Let’s see a few things that the Bible says. Now, these verses teach you about what the Bible Says about money. Today, I am sharing with you an Abundant Blessings Scriptures-Printable of verses that teach you about being prosperous in your finances. They are daily affirmations you can say each morning. First, you need to know who you are in Christ and does He want you to succeed? Of course, he does. In the Dave Ramsey course, he points out if we as believers aren’t earning the money because we think it’s not His will, then who ends up with the money? Dave Ramsey jokes and says “the other guys”. We have to remember that money should be used for good. First, we should not be in debt. Look at our country. We should be debt free. It is very freeing and you should be telling your money where to go, not letting your money control you. Once you change your behavior with money and spending, you will see that you probably have enough to pay all your bills, without credit cards and start saving or investing. I am not going to say this is easy because if it took you 10 or 20 years of bad behavior patterns to get into debt, it won’t change overnight. We live in a microwave generation, we want it now when we should be living in the slow cooker generation and have patience. First, you really have to want to change. There is a famous saying for any addiction program you find. You have to be sick and tired of being sick and tired of your circumstances to start making changes. Remember the meaning of insanity. Doing the same thing over and over and expecting different results. We all do this. I am guilty too. But when I decided to make a change in several areas of my life the pain didn’t last as long as what I had been going through. Start by making that first decision to change the legacy of your family. Then download this Scripture chart and start looking in the mirror and saying these each and every day. 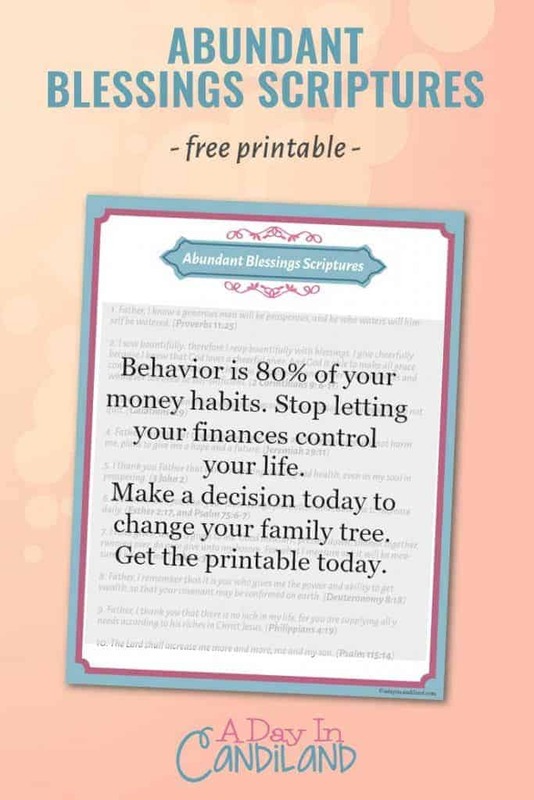 Get this Abundance printable now and start working it. Here are a few tips I have been using that is making a difference. Start deleting emails from companies that are sucking your wallet dry. Figure out what stores or triggers in your budget you can do without for a while. Mine is Target and Michaels. Don’t go there unless you have to have it and you only go in for what is on your list. Choose to live like no one else so later you can LIVE like no one else. Start creating an additional income to start paying off your debt. Join a Financial Peace University course in your area. Make sure your spouse is doing the monthly budget with you. Cut back on eating out at least one time less a month. Decide to volunteer somewhere in your community at least one day a month. Get a financial accountability partner. Remember this is only for a short time to change your behavior and patterns. Once you feel differently about money and what it can do for your future and your family and the World, it will change your life. Please share this on Pinterest and Facebook with your friends and let me know your thoughts in the comments. What is Your Money Mindset? It’s Either Positive or Negative.